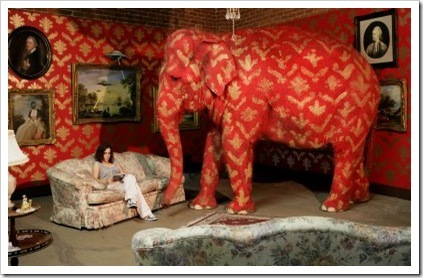 I’ve heard the phrase “Elephant in the room”, that is an obvious truth or point that everyone present avoids. This piece by Banksy [^] however brings this to life. Banksy is a stenciller / graffiti artist with an often surreal or satirical lean, and sometimes confronting images. Every so often there are email compilations or his work or some mainstream press-coverage. The website may not have the best navigation, and the load time on some pages can be a little slow, but it is well worth the wait. For more about Banksy [^] check-out Wikipedia. On the way, I had a slight detour via Wikipedia’s Elephant Joke [^] page – just the sort of thing that appeals to CannibalRabbit’s twisted sense of humour!